A friend of mine recently shared with me that she underwent her own crisis several years ago. She said up until then, she thought that her stuff - her baggage, her issues, whatever you want to call it - were all packed up in boxes and locked neatly in a room somewhere. Then she had this crisis, and realized that no, these boxes were actually stacked high on a palette and she was dragging that palette behind her. She went to therapy and one by one, unpacked as many of those boxes as she could. As I write this, I'm procrastinating the final stages of packing a house's worth of stuff to move to a different country and into a fourth-floor walkup. That last part is key: The thought of carrying everything you own up four narrow flights of stairs is great incentive to own less stuff. To that end, last Monday I had six full garbage bags and three overflowing recycling bins on the curb for pickup. This morning, a thrift store came to pick up about about six boxes of donation items, plus a bunch of furniture (assorted chairs and tables) (why did we even have "assorted chairs and tables"?). There are at least two more garbage bags going out tonight, and one of the recycling bins is already full. At the same time I'm doing this physical packing, I'm trying to unpack a bunch of psychic boxes. Normally unpacking is way more fun than packing, but this kind of unpacking is *hard*. It turns out that I didn't make conscious decisions about what to put in these psychic boxes, and now as I unpack them, I have to decide what I really want. 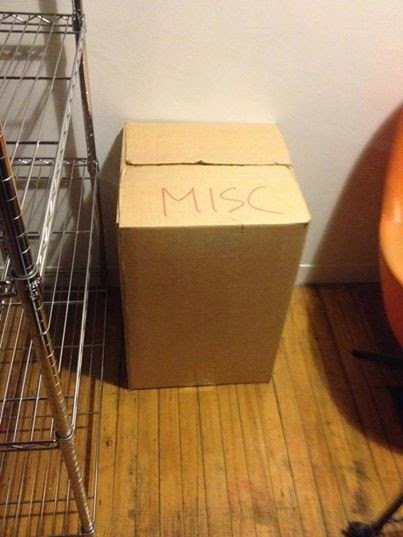 The thing I'm realizing is, there will always be a box labeled Misc., and the only way to find out what's in it will be to unpack it and make decisions about what to do with the stuff. Some of it will probably end up back in the same box, or in another box named Misc. with some other stuff, and in that context maybe it will look different, and the next time I look at it maybe I'll make a different decision about what to do with it. And while it's inevitable that I'll keep adding stuff to these boxes, hopefully I'll do it more deliberately, and eventually I'll end up with fewer of the Misc. boxes. It might help if I start to think of life as a fourth-floor walkup. In other news, I'm reworking my last post (the one about relationships that's no longer here, but Google can probably still find it somewhere). It didn't make sense. I wrote it as a response to a conversation, not really deliberately, and if any of you actually understood any of it, you were probably like, um, yeah, no duh (because it was about projecting and is in every relationship book ever written). The real point of that post was meant to be this. My friend D has a chalkboard in her kitchen, with a TODO list on it. I noticed the other day that under "haircut" is written "rel'ship". I asked her what that was about, and she said, "Oh, that's to remind us us to work on our relationship." "That's amazing!" I said. "I love that you're conscious about it." She laughed. "Well, yeah, but it's under 'haircut'." Fair enough. Getting a haircut is easy.